Lately, we heard about the newly introduced apple product, which is the iPhone 6 and iPhone 6 Plus. The iPhone 6 Smart phone is really a great one with loads of features, of course you know that apple is one of the best companies whenever it comes to smart phone production. There products are very much unique and well facilitated. You might be wondering what this article is all about, but I tell you one thing, no matter how cool or sophisticated a device might look, there would always be some declining facts about that device. 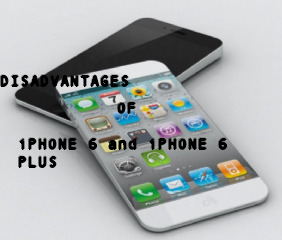 Since the release of the new iPhone 6, there have been some submitted complains about the device, and that is what brings me to knowing the 3 main disadvantages of purchasing the new iPhone 6 and iPhone 6 Plus. After the release of iOS 8.0.1 operating system, it was noticed that the iPhone 6 and iPhone 6 Plus no longer connects to the cellular network and also, the touch I-D buttons of the iPhone 6 and iPhone 6 Plus couldn't function effectively, and cause it not to scan fingerprints, and some other bad effects. This issue really decreased the reliability and efficiency of the iPhone 6 and iPhone 6 Plus. In fact, it was due to these facts that apple released iOS 8.0.2. Previously, I published an article on “some technical reasons Apple released iOS 8.0.2”. You can take a stroll to that article and get to know some other problems the iPhone 6 and iPhone 6 Plus faced after the release of the Apple iOS 8.0.1. This was one of the treading problem the new iPhone 6 suffered. It's a very critical problem. And this problem caused Apple to suffer another social media backlash just after defending itself about #bend gate. It was discovered that the iPhone 6 bends whenever carried in a tight pocket, which is very a critical issue. Due to the stories of iPhone 6 bending in user's pocket, blackberry CEO used that to mock the iPhone 6. I must confess, this issue is very critical and one of the main disadvantages of the new iPhone 6 and iPhone 6 Plus. The cost of the new iPhone 6 and iPhone 6 Plus is on the high side. Over 80% of the average working individuals wouldn't be able to afford the new iPhone 6 and iPhone 6 Plus due to its high cost. That the iPhone 6 and iPhone 6 Plus has loads of impressive features, doesn't mean that you have to purchase it at that high price. Because, the specifications of the iPhone 6 and iPhone 6 Plus isn't that sophisticated compared to it's price tag. If you observe, you would notice that you can compare most android smart phones of lower price with the iPhone 6 and iPhone 6 Plus. I also published an article that explains “where HTC one 8 Stands compared to the new iPhone 6 and iPhone 6 Plus”. Always note that, whenever you wish to purchase any smart phone, try to review it's specification to know if its price tag actually worth it. As for the iPhone 6 and iPhone 6 Plus, I don't think that the price tag worth it, regarding to it's specifications.